Education • Utah native Richard Williams will take the helm in August. Jud Burkett | The Spectrum & Daily News Utah Board of Regents Chair Daniel Campbell. 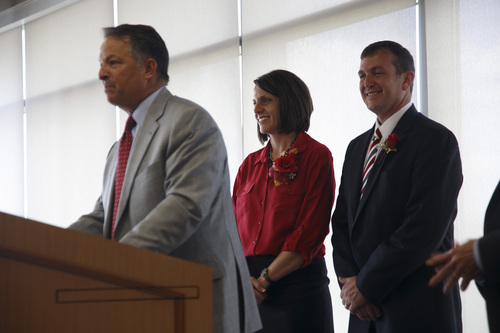 left, introduces the new President of Dixie State University, Richard "Biff" Williams, and his wife, Kristin on the campus of Dixie State University Thursday, July 17, 2014. 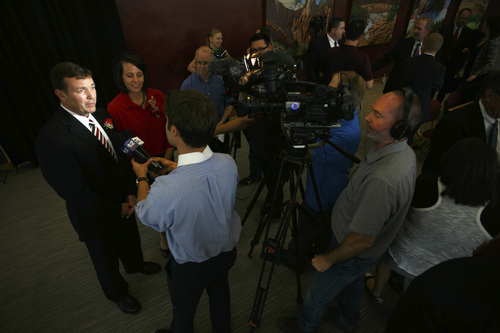 Jud Burkett | The Spectrum & Daily News Richard "Biff" Williams, chats with members of the media shortly after the announcement was made naming as the new president of Dixie State University Thursday, July 17, 2014. 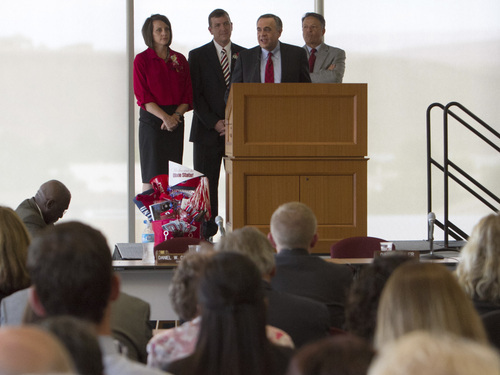 Jud Burkett | The Spectrum & Daily News Utah's Commissioner of Higher Education introduces the new President of Dixie State University, Richard "Biff" Williams, and his wife, Kristin, left, on the campus of Dixie State University Thursday, July 17, 2014. | Courtesy Photo Richard ìBiffî Williams has been named the 18th President of Dixie State University. Williams will succeed Dr. Stephen Nadauld, who is retiring after a long, storied career in higher education. Jud Burkett | The Spectrum & Daily News Former Dixie State University President Stephen Nadauld, fourth from right, and his wife, Margaret, join Dixie State alumni and hall of fame member Delmont Truman as he gives two thumbs up while leading a group Dixie State dignitaries in a chorus of the song "Are You From Dixie?" 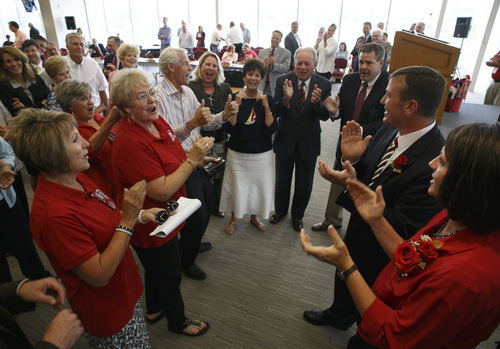 as they welcome Richard "Biff" Williams, second from right, and his wife, Kristin to the campus shortly after the announcement was made naming Williams as the new president of Dixie State University Thursday, July 17, 2014. A northern Utah boy who attended college at Weber State and then left the state is returning home after being named Thursday as the 18th president of Dixie State University. 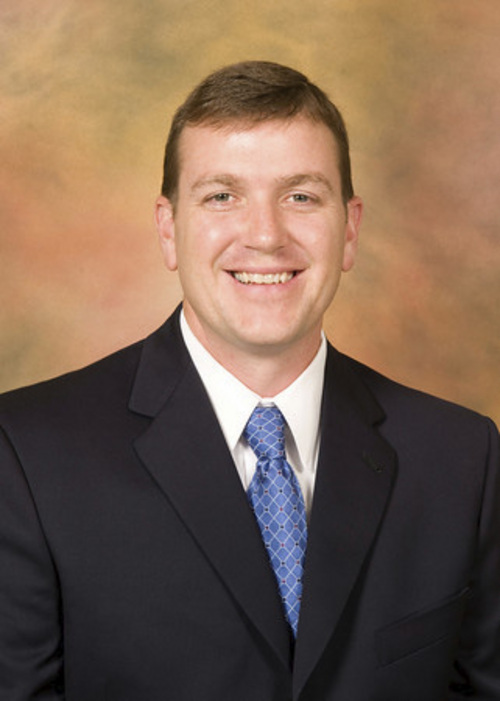 Richard "Biff" Williams grew up in Brigham City and attended Weber State University before heading off to hold various positions at Indiana State University and the University of Northern Iowa. "I&apos;m so excited to finally get the call and be appointed. I&apos;m very emotional," said Williams, 43. "This is such a great institution. I really studied for a long time to prepare myself so I could have this opportunity." Williams will begin his new job sometime in August before the start of the academic year. He will be joined in St. George by his wife, Kristine, and their five children. "My first priority is getting to know as many people as possible to get a lay of the land," Williams said. "The work ethic here is amazing. I&apos;m excited to be a part of that ethic. Going forward, I want us to look at the needs of our area, our state, our region, and most importantly, the needs of our students and what will make them successful in the future." A 22-member Presidential Search Committee, chaired by Regent Wilford Clyde, narrowed the list down from an applicant pool of more than 40 to the three finalists. "Dr. Richard Williams brings extensive experience and a high level of professionalism that will be an asset to Dixie State University and the Utah System of Higher Education as a whole," Dan Campbell, chairman of the Board of Regents, said in a prepared statement. Williams, who will earn an annual salary of $213,829, served as provost and vice president for Academic Affairs at Indiana State University. He also served as the founding dean of the College of Nursing, Health and Human Services at Indiana State University. Dixie State University serves roughly 9,000 students on its campus in St. George and through the Hurricane Education Center in Hurricane. Williams feels the various positions held throughout his career will help him work with staff at Dixie State University. "As the president, that will allow me to relate to all levels of the university," Williams said. "I feel fortunate to have held those various jobs." The other two final candidates included: Reid Neilson, a former assistant professor at Brigham Young University, and Dan Capener, dean in the Davis College of Business at Jacksonville University in Florida. Neilson also volunteers as managing director of the history department at BYU. Capener earned a degree in political science from BYU and an MBA from the Thunderbird School of Global Management in Arizona. The finalists went through a screening process and two days of interviews with representatives from DSU&apos;s faculty, staff, students and administration, as well as interviews with the Board of Regents. "I am confident in President Williams&apos; ability to effectively lead Dixie State University, and I believe he is the right president for this institution," added Dave Buhler, Utah commissioner of higher education. Richard "Biff" Williams was named the 18th president of Dixie State University on Thursday. • Served as provost and vice president for academic affairs at Indiana State University since 2013. • Founding dean of the College of Nursing, Health and Human Services at Indiana State University. • While a faculty member at the University of Northern Iowa, he served as associate dean of the College of Education, executive associate director of the School of Health, Physical Education and Leisure Services and chairman of the Division of Athletic Training. • Holds a bachelor&apos;s in lifestyle management from Weber State University, a master&apos;s in athletic training from Indiana State University and a Ph.D. in curriculum and Instruction from New Mexico State University.